Customers sometimes ask us if our family uses our products. Definitely and specifically when an skin issue is involved. These are photos of my 5 month old grandson who developed an unexplained dry, raised rash. 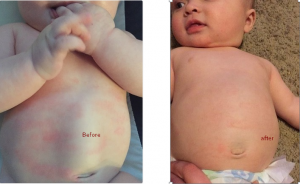 A quick application of commercial baby lotion only inflamed the skin further. My daughter asked what I had that might help, so I gave her a jar of our essential oil based Eczema/Psoriasis Cream to try. After applying the cream daily for two weeks, there was great improvement in the skin color tone, the softness, moisture content and most importantly a significant reduction of the red rash. Continued use has kept Logan’s skin supple, less inflamed and comfortable in his skin. Our Eczema/Psoriasis cream is an organic based cream with Dragonsblood Resin from the Croton Uechleri tree found in the Amazon Rainforest of South America. Known for wound healing, anti-inflammatory and protective properties. 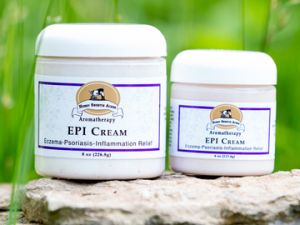 We also add in Rose Geranium essential oil as an anti-inflammatory, Clove Bud essential oil as an analgesic and Peppermint essential for itch relief and cooling. Read more here! These essential oils are wonderful when used properly. However, please don’t liberally apply any of them directly to your skin in the hopes it will help your Eczema. Essential oils must be blended in a carrier cream or oil at the right concentrations in order to benefit skin conditions. Too much can exacerbate a skin condition and potentially cause allergic reactions. That is why essential oil blends should be formulated by certified aromatherapists. With hundreds of compounds in any single oil, aromatherapists are trained to know what will and will not work together. The wrong blend may render the cream inert of any therapeutic benefits or be too strong and cause a reaction. The expression “a little dab will do ya” could not be more true than when it comes to the application of essential oils. For safety sake, they should never slathered on like lotion or ingested. Nature’s chemical compounds are chock full of benefits when used properly. Learn more about aromatherapy and essential oils at www.NAHA.org.